This semester, I want to answer the question "is there a typical mountaineer?". However to answer this question, it is first necessary to understand the demographics of early mountaineers. 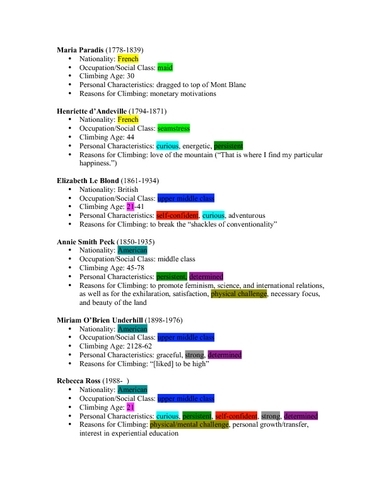 In the following document I have compared several characteristics of five early female mountaineers and myself. Brown, R. (2002). Women on high: Pioneers of mountaineering. Appalachian Mountain Club: Boston.